A Chuseok visit to Dragon Head RockExtended Chuseok holiday a great opportunity for a visit. Chuseok marks perhaps the most important national holiday in Korea, as it is a time when family gathers together to celebrate and give thanks for the autumn harvest. Traditionally, families return to the place of their birth, and partake in ritual ceremonies to honor their ancestors. However, more and more in recent times, it is not uncommon for people to spend their Thanksgiving holiday outside the family home. It is no secret that Jeju is one of the most sought out areas in Korea for sightseeing and enjoying what the outdoors has to offer, as it is replete with natural treasures with a rich tradition and history which spans back more than a thousand years. One such place mired in island lore is Yongduam, also known as Dragon Head Rock. According to legend, the rock formed when lava flowed out of a volcano two million years ago. Narrative accounts point to two possible origins of the dragon of the rock. The first tells that the dragon was sent by a dragon king to collect an elixir of life on Mt. Hallasan. The second says that the dragon made off with a sacred jade stone which belonged to the guardian of the mountain and was felled by an arrow and turned to stone where the rock stands today. To be sure, there is a particular feeling when one comes to this ancient stone formation. 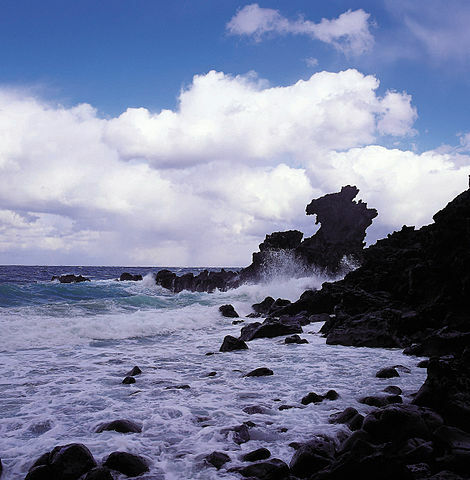 The monument has long been a staple in Jeju mythology, and it is believed that dragons, and particularly black dragons bring bravery, hope and good luck, making it a popular destination for locals and travelers alike. When looking out on the water, it becomes very clear that this place told a story many ages ago, a story both beautiful and painful. It is a place to reflect, and be thankful. The motion of the waves seems seamless until they come crashing in on the rocks, meeting their final, untimely end. Tourist reviews have likened Yongduam to be a place where one can go to relax and enjoy the cool air by the water. But, there is much more to it. If one listens carefully, it is still possible to hear the wind and the waves speaking to each other in tones, telling and retelling the legend of what happened here all those years ago. If one is lucky enough, it could even be possible to hear the story told by the older generation of Jeju inhabitants, who are well versed in the legends and oral tradition of the island. If there is ever a perfect time to go sightseeing on the island, it would be this time of year, when people all over the country are taking time out to reflect on the things they are most thankful for. For those of us who are here, it is great fortune enough to be able to call this beautiful island home. But, living here is merely not enough. Jeju itself is an opportunity to learn and appreciate how much is on offer here, from the natural beauty to the traditions, and to the people who have shaped the place of the island in Korean history beginning thousands of years ago. With the long holiday in full swing, why not take the chance to venture out to this place of mythical beauty right in our own backyard? If a crisp breeze and a chance to listen to the retelling of a story of the ages tweaks your interest, the black dragon is waiting to bestow good fortune on you with the celebration of the autumn harvest at hand.